»an+1= an+1 (t=168h)« is more a visual result than mathematical. 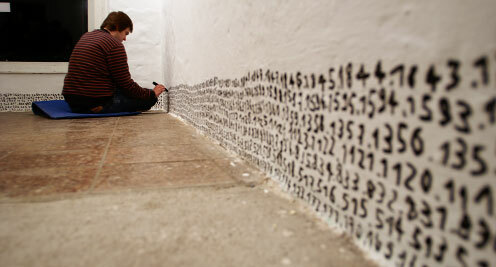 In this exhibition the performer will extend the room by writing digits in a upward numerical string from zero to a number nobody can guess. The artist will write each addition counterclockwise over walls, windows and doors. The digits differ in their sizes between five and eight centimeters depending on physical and mental condition. At the opening, where the artist provided about five lines of numbers, every visitor can leave their guess which number will be the last one in the upper corner. The one that guesses correctly, and comes closesest to the result will win a small price. A performance of Benjamin Kunath. The performance runs for a whole week. The final result should been ready in time for the finissage. All this time the artist will not leave the room inside the Kuhturm. All he does is eat, sleep an writing those numbers. The final result of this performance is the number 18086.